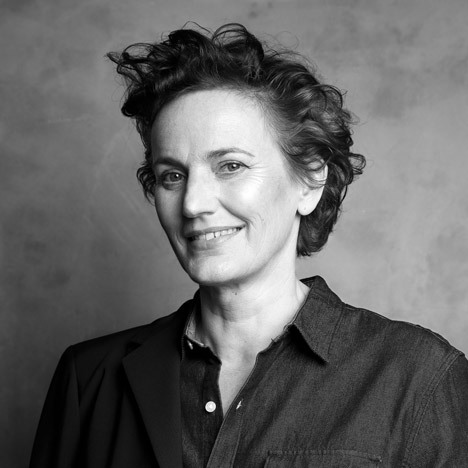 Interview: after completing Europe's largest public library in Birmingham, architect Francine Houben of Dutch studio Mecanoo spoke to Dezeen about the role of the library in the digital age and claims libraries are as central to society as cathedrals once were. Houben dismisses the suggestion that digital technologies will see the end of libraries, explaining that the university library completed by the firm in Delft is still the most popular place in the city. "We were always prepared that there would be less books in the future," she said. "The research machines will always be here, but to me the space is much more important." See more images of the Library of Birmingham, or see all our stories about Mecanoo. Amy Frearson: Can you describe the composition of the building? Francine Houben: It's a big volume, a lot of square metres. So what we did was to make a huge lower ground floor, then made a kind of composition of a square, with Shakespeare at the top of it. Birmingham is a very green city but not in the city centre, there are a lot of grey roofs so we wanted to make sure if we made terraces we wanted to make them very green, like elevated gardens. What is nice for a library is to have a garden to read in. So we made these two to add green space to the city. AF: How did you develop your concept for the facade? FH: I didn't want to make a brick building, because we needed a lot of light, but I didn't want to make a glass building either. It's so beautiful to sit here because of the reflections and the shadows, and the changing of the weather. It's different from December to June. Some people say the smaller circles are from the history of the jewellery quarter, and some think it's the circles of knowledge. To me the idea is that all people from Birmingham can have this story. But we actually designed the building from the interior. I'm very much into landscaping and as a landscaping architect you try to create your own world. You try to hide what you don't want to see. So in the amphitheatre you create your own world, and on the terraces you create your own panorama and you think you're in the hills. When you enter, you feel enclosed by the building. AF: Why did you choose to include so many circular motifs and round spaces? FH: I think that it's something that happened quite intuitively, as I realised it was very much about rotundas. We started with this sequence of rotundas. What happens if we connect rotundas with escalators through a building as a journey? At the end you would see the sky, the stars. And it would be all connected. AF: What are your favourite moments in the building? FH: To sit. I could sit for days in the building. On the mezzanine level there's a coffee bar, where you can get a coffee and watch people passing by; I could sit there for hours. It's also nice to be on the escalator and, when there's beautiful weather, to sit in the garden. It depends on the weather and my mood. I think that's the fascinating thing in this building, that it has so many points on the journey. There's many destinations and places where you want to spend time. AF: You describe the building as a people's palace. Tell me more about that? FH: I wanted to make a people's palace because it's a public building and I think at this moment libraries are the most important public buildings, like cathedrals were many years ago. We wanted it to be very inviting and welcoming, not just about books. It's not just for the rich or the intellectuals, it's for everybody. But of course you have sequence of change in the building, as it's a combination of a public library and a research library, so it gets a little more serious and academic as you go up. AF: With the growing integration of of computers and digital technologies in libraries, do you think the library still has an important role in the digital age? FH: I've been part of this discussion for many years. When we did the library of the technical university in Delph some people said "why do you need a library?" But it became the most popular place of the university, of the whole city. It attracted tourists and is always full of people. AF: And how has that building adapted to digital technologies? FH: When we first started 15 years ago we had 300 computers. They are not necessary anymore because a lot of people have their own laptops. Maybe now there are about 100 computers there. We were always prepared that there would be less books in the future. This will also happen at Birmingham, but the big difference is this is a public library, not one for a university, and the research library is combined with an archive. So this library will always keep a lot of books. AF: What about some of the other technologies that have been introduced to libraries, such as the robotic book retrieval at Snøhetta's North Carolina State University? FH: That can always happen, like systems where you find a book on your iPhone. I think the research machines will always be here, you'll know exactly where to find things, but to me the space is much more important. AF: So do you think an ability to adapt to change is important to a library building? FH: Yes. It's funny because we started construction very quickly, while we were still working on where to put what furniture. But that didn't matter because the whole building was made so that you can change what goes where. That will also happen in the future. AF: What else do you think is important for a public library? FH: One of the things I was very keen on was to make a good floor. It's an elevated floor but it really feels like a strong floor. With 10,000 people coming through a day it has be robust and practical, but it should not look like an airport or a shopping mall. It's ceramic, so it's a little bit like marble, but it beautifully reflects the light coming in. So the floor, the ceilings with the good acoustics, the different kinds of light and the façade, that's the building, and then the rest is flexible. I'm very happy with the building and I think that's what we promised to do, a people's palace, a place for all, interlocking a vision of the future with a thinking of the future, but connected to the memories of the city.